How to Create and run a simple Web Dynpro application. 1. 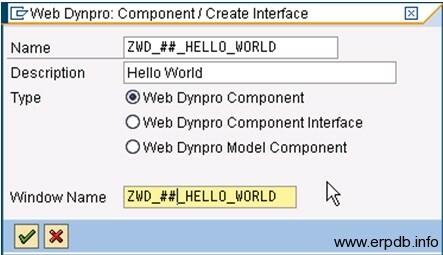 Create a new Web Dynpro Component called ZWD_##_HELLO_WORLD. Change the proposed window name to MAIN. – Enter the name TEXT. – From the Type drop down list, select TextView. Now select the newly created element TEXT and change the design property from standard to header1. 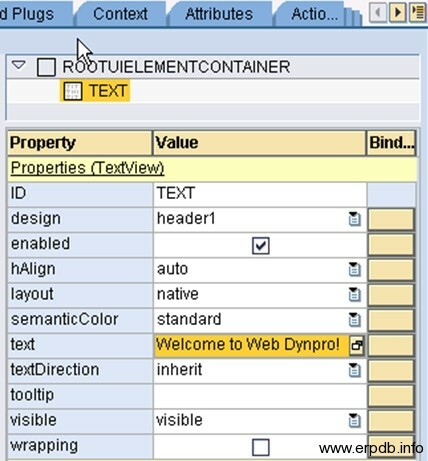 Enter “Welcome to Web Dynpro!” in the text property. 5. Embed view HELLOWORLD in MAIN window. Double-click on the window main. Right mouse click on the only element MAIN and choose embed view from the context menu. Choose helloworld as view to be embedded and click on continue. 6. Save and activate your new Web Dynpro component. 8. Lastly, we must create an application so that we can access the Web Dynpro component via a URL. Accept all default settings and press Save.